Laboratories use flammable chemicals for experiments and analytical tests. Safely dispensing into vials, flasks and test tubes limits the risk of fire. It only takes a moment for a flammable liquid to catch fire and cause serious injury. In 2013, a high-school student in Douglas County, GA, caught fire while dispensing flammable chemicals. During an AP open house, students performed various chemistry demonstrations. One flammable liquid dispensed unexpectedly fast and ignited, catching a student on fire. A fellow student grabbed a fire blanket to extinguish the flames. Despite his quick action, the fire caused burns on 25 percent of the other student’s upper body. Using certified and controlled dispensing containers helps decrease the risk of fire, improving overall laboratory safety. Designed for dispensing chemicals into smaller containers, Justrite metal laboratory cans are UL listed and / or FM approved. Two dispensing container models are available: one for dispensing chemicals from a shelf, the other for dispensing from a tilt rack. Flexible metal hoses thread into the faucets of both types of cans. This allows complete control when pouring chemicals into narrow openings. Shelf dispensing cans feature a safety faucet at the base for gravity draining. A top spout provides access for refilling the safety can and also acts as a pressure relief vent. Shelf dispensing cans come in 2.5- and 5-gallon (9- and 19-liter) sizes. The 5-gallon (19-liter) tilt-rack laboratory can mounts directly into a sturdy tilt cradle. The dispensing spout is on the top of the can, on the opposite side to the fill spout. When dispensing, the tilt cradle allows the can to swing forward while holding the can securely on the bench top. As in the shelf dispensing can, the fill spout also acts as a pressure relief vent. Non-metallic safety cans are ideal for laboratory use. Their hard polyethylene material resists chemical damage. Cans feature a steel flame arrestor with a current-carrying carbon insert to ensure proper grounding. 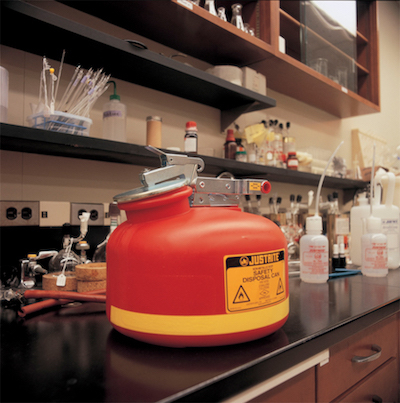 The oval shape of the ½- and 1-gallon (2- and 4-liter) cans make them a popular selection for labs. Five oval cans occupy the same space as three round cans. Dispensing of flammable liquids causes a buildup of electrical charge known as static electricity between metal containers. Bond dispensing and receiving containers together and ground one of the containers to an earth point. Use antistatic wires with alligator clips or clamp fittings. This creates a safe path for electrical charge to dissipate without causing a spark. Justrite supplies Type I and Type II laboratory safety cans in metallic and non-metallic options. View all our chemical storage containers here. Click here to view our full catalog. Any of our non-metallic safety cans (including our line of laboratory carboys) would work well with ethanol. The non-metallic safety cans give one the ability to ground or bond as required by OSHA/NFPA for dispensing liquids with a flashpoint below 100°F. If you’d like more information about chemical compatibility of our carboys, please consult the Laboratory Carboy Chemical Compatibility Chart. need recommendation for 'carboy' that can store/dispense ethanol.